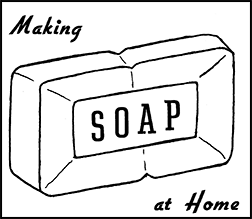 I recently found a marvelous brochure, Making Soap at Home from February, 1955. Prepared by Irene Crouch, Extension Agent Home Management, and published by the Extension Service (North Dakota), this little document outlines how to make soap at home. The how-to section is pretty straight-forward (mix to trace, pour into molds, cover with blankets, leave it undisturbed for 24 hours and then unmold. There is some additional information about temperatures for the oils and lye solution which I hadn’t seen elsewhere, in particular giving specific temperatures when using “soft rancid fat” (yes, you can make soap with rancid fat). There was something somewhat unique that I hadn’t ever seen before having to do with the mold. It says to pour the mixture into a “wooden box that has been soaked in water and lined with a clean cotton cloth dipped in water and wrung nearly dry”. The cotton cloth is used to pull the soap from the mold. I assume there is something about soaking the wood in water and using a damp cotton cloth that keeps the soap from sticking too badly. If you’ve ever tried this method, please post a comment! The lining of the mold with a damp cloth was done by my mother and grandmother. Yes, it does help for the soap not to stick to the mold. How interesting! Do you have any idea if it’s easier (or harder) to deal with than, say, butcher paper? I’ve never seen them use butcher paper, so that I don’t know. Perhaps the wood swells when wet and then shrinks back to size as it dries….and the soap pulls away from the mold? Just guessing…found your blog very entertaining! Thanks! That’s what I thought. Maybe it stops the wood from absorbing the moisture in the soap since it’s already saturated? Love vintage instructions like these! I am very curious about the information about using rancid fat for making soap. Seems like it would result in some rather stinky soap! Yes, use of rancid oils is questionable. I have seen reference to it in some of my older soapmaking books. In all cases, complete saponificiation is excepted in the finished soap (no superfat or lye discount, which would leave unsaponified rancid oils). In fact, in most cases where rancid oils are referenced, the soapmaking process includes over-lye’ing and then neutralizing the soap (in a commercial manufacturing process). From this, I would take it that rancidity of the oils used in making the soap do not necessarily result in a rancid finished product.